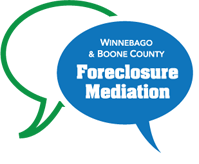 The 17th Judicial Circuit of Illinois’ Residential Mortgage Foreclosure Mediation Program provides a unique opportunity to aid families throughout Winnebago and Boone Counties who are in foreclosure. Mediation is a process where a neutral third-party (a trained mediator) helps borrowers and lenders communicate to explore options available to a homeowner. Click here to start our application! Enter your email address and password you selected below to be logged in to the applicant area of our site. Please click the learn more button below to be directed to our log in screen. To take advantage of the 17th Judicial Circuit of Illinois’ Residential Mortgage Foreclosure Mediation Program, you’ll need to create a profile. Please click the learn more button below. Have questions? We are here to help. Whether you are inquiring about site assistance, technical support or for general inquiries you've come to the right place. To contact us please click the learn more button. If you have been served a residential mortgage foreclosure complaint, which could cause you to lose your home, in a case filed on or after June 1, 2014 in Winnebago County, or in a case filed on or after November 1, 2014 in Boone County, the Foreclosure Mediation Program may be available to assist you. You must submit a completed application found below within 21 days of being served a complaint to be eligible for the Program. Get Started. Once you’ve created a profile and completed an application, the program will contact you about your next steps. If you require assisance call (815) 319-4995 to speak with a represenative from the program. *WARNING- ILForeclosureProgram.org is the OFFICIAL website for the 17th Judicial Circuit of Illinois’ Residential Mortgage Foreclosure Mediation Program. Program services are provided by a HUD approved, non-profit housing counseling agency and trained mediators. The Program is supported by funding from the Circuit Court through filing fees, and is provided FREE of cost. If you feel you have become a victim of mortgage assistance fraud, you may contact Illinois Department of Financial Professional Regulation’s Mortgage Fraud Task Force at 1-800-532-8785. Once your profile information is complete, you’ll need to complete the seven-step online application for assistance. It is necessary to complete all steps and submit the application within 21 days of when you were served with a foreclosure summons and complaint. Each step contains critical information we will need to be able to help you. This application will take approximately 45 minutes, and you may save in between steps. Please call (815) 708-6490 if you have any questions.